Class section id for CSE252B: #513471. Lecture: MW 5:00-6:20pm, HSS 2154. Class mailing list: http://graphics.ucsd.edu/mailman/listinfo/cse252b. 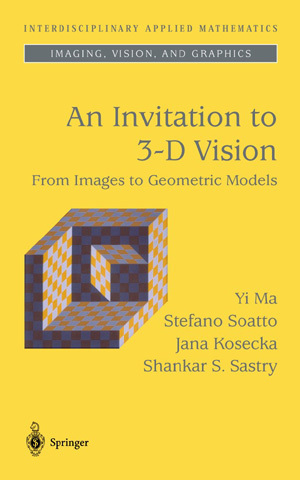 Topics to be Covered: Geometric models of image formation. Projective Geometry. Interest point detection. Robust feature matching across wide baselines. Calibrated and uncalibrated reconstruction of 3D models of objects from 2D images. Construction of photo-mosaics. Camera calibration. Optimal camera pose and structure estimation. Prerequisites: linear algebra, calculus, probability and statistics. This course makes extensive use of Matlab. Click here for information on Matlab. Here are the Grading and Course Policies and the Scribe Resources. Most recently updated on Apr. 5, 2004 by Serge Belongie.